I’m so grateful to be able to participate in The Nashville Food Project’s first ever Simmer series! During Corn 5 Ways, I’ll be joined by chefs Tandy Wilson, Karla Ruiz, and Rebekah Turshen, as well as drinks expert and food writer Jim Myers for a multi-tasting experience. These monthly pop-ups bring chefs, writers and educators to TFNP’s new community kitchen for interactive experiences around food. All proceeds benefit their mission: Bringing people together to grow, cook and share nourishing food, with the goals of cultivating community and alleviating hunger in our city. In the mid ‘00s, Erin Byers Murray ditched her pampered city girl lifestyle and cushy job and convinced the rowdy crew at Island Creek Oysters in Duxbury to let a completely unprepared, aquaculture-illiterate food and lifestyle writer work for them for 18 months to learn the business of oysters. The result is the award-winning book Shucked: part love letter, part memoir, and part documentary about the world’s most beloved bivalves. During her time as a writer, Erin and Chef Jeremy Sewall became close friends and collaborators. Together, they wrote Chef Sewall’s first cookbook, James Beard Award nominated, The New England Kitchen. 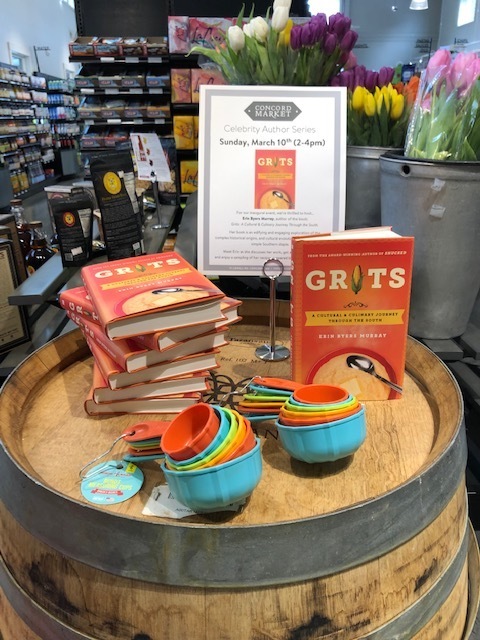 On Tuesday, March 12th, join Erin Byers Murray, friend of Island Creek Oysters, for a night to celebrate her new book, Grits: A Cultural and Culinary Journey Through the South. Grits is a fascinating look at grits in Southern cuisine, including recipes perfect for cold New England nights. Tickets are $30 and includes a signed copy of the book and bites. Drinks will be available through cash bar. Join the team at Island Creek Oyster Bar for a night with award-winning author Erin Byers Murray and Chef Jeremy Sewall. In the early '00s, Erin Byers Murray ditched her pampered city girl lifestyle and cushy job and convinced the rowdy crew at Island Creek Oysters in Duxbury to let a completely unprepared, aquaculture-illiterate food and lifestyle writer work for them for 18 months to learn the business of oysters. The result is the award-winning book Shucked: part love letter, part memoir, and part documentary about the world’s most beloved bivalves. During her time as a writer, Erin and Chef Jeremy Sewall became close friends and collaborators. Together, they wrote Chef Sewall’s first cookbook, James Beard Award-nominated, The New England Kitchen. On Monday, March 11th, join Chef Sewall and Erin Byers Murray for a reading, cooking demo and tasting in celebration of her new book, Grits; A Cultural and Culinary Journey Through the South. Tickets are $65 per person and include a signed copy of Grits, oysters, beer and wine, chef demonstration, and tastings inspired by the book. My first New England signing! Come on out to The Concord Market, a gorgeous space housing great food and drink purveyors. We’ll have samples, a sip, and you can grab a signed copy of Grits. Find me inside the book signing tent at #CHSWFF on Saturday March 9. We’ll have plenty of copies of Grits on hand thanks to Blue Bicycle Books — hope to see you there! CHARLESTON, SC- Think you know your favorite breakfast food? It's time to think again. During a lively discussion with grits expert and author Nathalie Dupree, farmer and miller Greg Johnsman, and author Erin Byers Murray of, Grits: A Cultural and Culinary Journey Through the South, we'll look at the history of this iconic dish and its journey to the modern table. From its humble origins, to the rise of shrimp and grits, to its place in contemporary Southern culture as a vehicle to preserve the past, the conversation will give a better understanding of this beloved staple. The panel celebration of the classic Southern dish will occur Thursday, March 7 from 4-5 pm. The event is open to the public and will feature a milling demonstration in addition to the panel. Light snacks and drinks will be served. Erin Murray is the moderator of the panel. She is a Nashville-based food writer and magazine editor with several published cookbooks. Her latest book, Grits: A Cultural and Culinary Journey Through the South, looks at the evolution of grits in Southern cuisine and culture. Greg Johnsman, co-owner of Millers All Day and owner of Geechie Boy Mill & Grits is a featured panelist. His mill is in the front window of the restaurant and continues to be a focal point for his restaurant. With fourteen cookbooks and more than 300 television shows and specials under her belt, featured panelist Nathalie Dupree is the crowned queen of Southern culinary. She is known for her cookbooks that focus on classic Southern cuisine. Join me at this year's Southern Food Writing Conference in Knoxville, TN! Tied to the International Biscuit Festival, this first-class writers' conference brings together great minds from across the food world. I'll be speaking about the art of facing rejection... but more importantly, some of my serious food writing heroes will be there, like Kim Severson, Kat Kinsman, and so many others. PLUS, the conference includes dinner at Blackberry Farm! I was lucky enough to attend last year and can attest that it is entirely worth the trip Would love to see you in Knoxville! Boston chef Jeremy Sewall is headed to Nashville for two book events: A dinner at The 404 Kitchen and a signing at Parnassus Books. Join Jeremy and his co-author Erin Byers Murray and pick up your copy of The New England Kitchen! Chef Jeremy will join Chef Matt Bolus at The 404 Kitchen for an indulgent five-course feast. Reservations: Limited seating available. For reservations, call 615-251-1404. Chitarra tossed in Uni with a Poached Egg, Caviar, and Bianchetti truffles. Following the dinner on Thursday, January 29, Jeremy and Erin will be at Parnassus Books for a discussion and signing. When: Thursday, January 29, 6:30 p.m.
Where: Parnassus Books, 3900 Hillsboro Pike, Nashville, 615-953-2243; parnassusbooks.net.